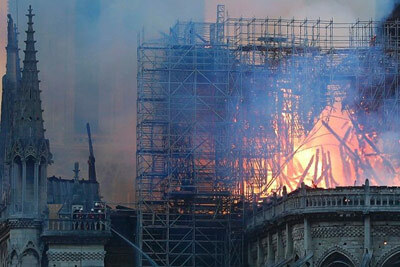 A catastrophic fire engulfed Notre Dame Cathedral in Paris this week, gutting and destroying the landmark’s spire. This disastrous event has stunned France, and the world. Notre Dame Cathedral is one of the most famous of the gothic cathedrals of the middle ages. The cathedral, which was built on the ruins of two earlier churches, was initiated by Maurice de Sully, then bishop of Paris. The foundation stone was laid by Pope Alexander III in 1163 and the high altar was consecrated in 1189. The choir, western façade and nave were completed by 1250, with further additions added over the next 100 years. This Catholic treasure is over 800 years old. The central spire was added during a restoration in the 19th century, replacing the original which had previously been removed. The cathedral suffered damage and deterioration throughout the centuries. After the French revolution, it was in a total state of disrepair and faced possible destruction, but was later saved by Napoleon, who was crowned Emperor in 1804 inside the cathedral. Major restorations were completed in the mid-19th century. After the first fire alarm sounded on Monday evening, it took Notre Dame staff 23 minutes to discover the blaze. By then, it was too late to stop the inferno. The fire blazed for several hours and came perilously close to destroying the whole building. 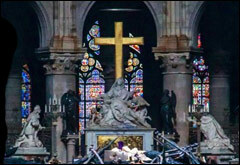 It has left the cathedral in a devastated state. Apart from its religious, historical and architectural significance, the cathedral was home to many significant relics and artworks. Among these relics are what is believed to be Jesus’ crown of thorns and the tunic of Saint Louis, both believed to have been saved. 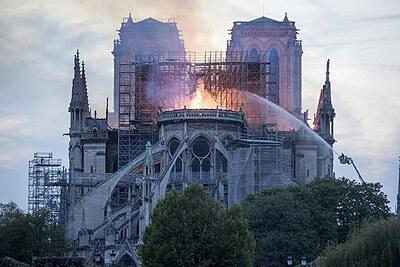 Reports indicate that many of the important pieces housed in the cathedral were removed in time, but some have been destroyed in the blaze. Some of the cathedral’s famous gargoyles are believed to have been destroyed or damaged. The timber carpentry, which had symbolic importance and is found inside the cathedral’s ceiling, is also thought to have been destroyed. Some of this carpentry was original, dating back to when the cathedral was built. Much to the relief of historians, there are reports that at least one of the cathedral’s three famous rose windows has survived the fire. They date back to the 13th century and have also suffered damage in the past but were restored in the 19th century. Fortunately, the fire did not reach the treasury, where other significant objects, including come chalices, were housed. 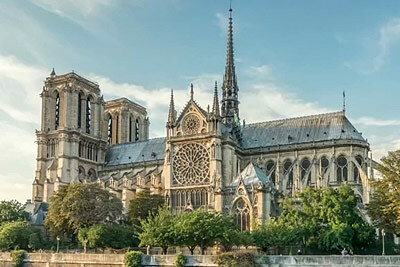 More than $1 billion has been pledged to restore the cathedral, with French President Emmanuel Macron saying he would like to see the cathedral rebuilt within five years.